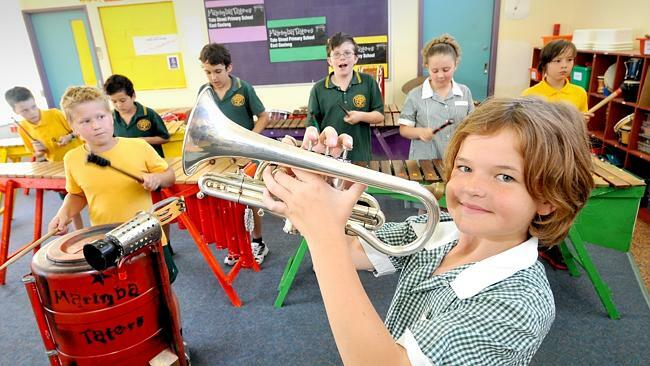 TATE St Primary is hitting the right note with NAPLAN results, and principal Terry Scott says music and drama have made all the difference. The East Geelong school has seen significant improvements since 2010, when a number of arts focused programs were introduced. Scores for reading, writing, spelling, numeracy, grammar and punctuation have increased by up to 100 points and a school report card once coloured red, indicating results below average, now shows mostly ‘above average’ green. 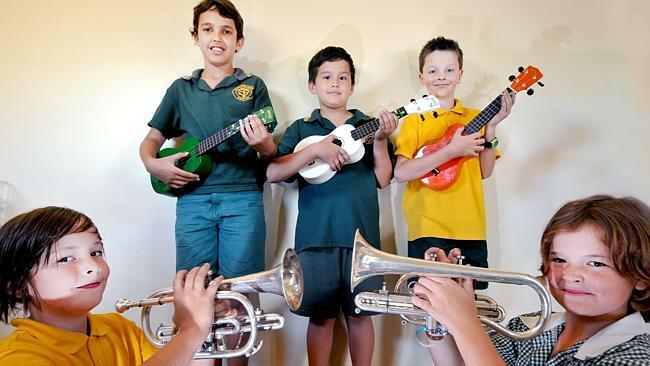 Music programs striking a chord include a brass band, ukulele band, boys percussion group and a marimba band, which has performed at the Port Fairy Folk Festival two years running. A Western Edge Youth Arts drama and literacy program based around Shakespeare and mythology has become a student highlight and a music educator visits English classes twice a week, using songs, beats and chants to assist lessons. Mr Scott is a passionate advocate for the programs, which are provided through fundraising, community grants and government funding. He says the philosophy is simple: happy, engaged kids make for enthusiastic, well-behaved students. He believes the findings of a parliamentary inquiry into music education last year, which stressed the link between in-depth music programs and improved learning, have been well and truly verified by his students. “Kids want to come to school — they’re engaged, in a happy frame of mind and enjoying learning. I don’t even know if they realise they are producing better work, and more work,” he said. Absence levels, which were two days above state average five years ago, are now two days below state average, and parent satisfaction has improved by 60-70 per cent in all 18 surveyed areas. Music Teacher Dani Rocca said music education was much more than a silly song and dance. “Music is pivotal to building confidence, as well as affecting all the ways we learn. It’s physical, we’re thinking, moving, playing, co-ordinating with others and using many different parts of the brain,” she said. I have just signed your petition for music to be provided by a specialist in schools to all students and I wanted to share our story in the hopes you may be able to use it to show other parents what they are potentially missing out on. My children are lucky enough to attend an excellent primary school with wonderful specialist teachers – Robina State Primary School. My husband and I (an accountant and a software programmer) have no musical skills so when we discovered our local school was music based we weren’t overly bothered either way and had we known at the time that another nearby school specialised in sports we probably would have attended there (as our eldest is very sporty) – luckily we didn’t know. Our eldest is an excellent child & student but has always been naturally reserved and not eager to seek attention though he is not shy. The school classroom music teacher is a wonderful & gifted teacher and our son excelled in recorder, prompting me to push him into band. He is a natural musician and has a lot of aptitude so he was given trombone – on the basis that he was gifted but wasn’t keen to stand out in the crowd. His other choice was trumpet but that is a visible player and he was adamant he didn’t want that. However the obvious enjoyment of music and his excelling in it have lead to bigger changes in behaviour than we could have imagined, although he was always a good student he was never class captain material as this requires a level of comfort and popularity with peers that he didn’t have. 18 months ago he was moved into the Jazz Band which, with a smaller number of performers, meant he was more visible in performing and he has become comfortable with being on stage and being ‘seen’. His music has changed his attitude to himself and his ability to see his potential. He was chosen class captain last year and is school captain this year, an achievement I would not have even contemplated him wanting two years ago and I doubt he would have contemplated for himself. I’m sure it has helped his classroom studies but I am most impressed by the change to his personality and the self belief he now has that are solely due to his involvement in music. He wanted to add a second instrument this year – he choose Trumpet. At Sydney girls’ school MLC, music director Karen Carey prepares her young students for a concert at the Opera House. Believing in the transformative power of great music, Carey insists upon a classical repertoire, sets a dauntingly high performance standard and requires the participation of every girl in the school. Carey inspires many of her girls, but some do not share her passion and are not afraid to say so. Mrs Carey’s Concert is the 2nd highest grossing documentary in Australian box office history. The teachers and Principal at St. Augustine’s school, located in the poorest section of the South Bronx have committed to a curriculum where the arts, especially music, are treated with the importance of any academic subject. In the last six years, enrolment has tripled and reading and math scores have improved dramatically. Something Within Me features interviews with students, teachers and parents along with an private peek into the classrooms and rehearsals of St. Augustine’s. A 52 minute documentary.